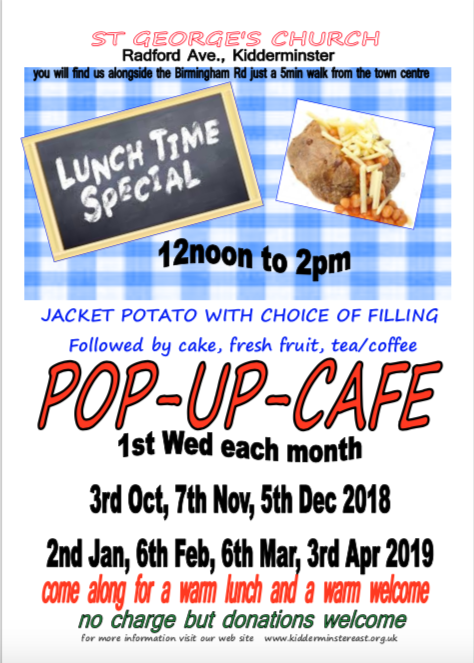 Pop up Cafe at St George’s Church is back on Wednesday 6th February! The menu will be Jacket Potato, Cheese and Beans: a favourite of many! There will also be the usual cakes, fruit, tea, and coffee. Pop up Cafe is a great opportunity to bring friends to church in an informal way. There is no charge but donations are welcomed – you can give what you can afford. We look forward to seeing you!